Once Upon A Time…….You could go to a theatre regularly and see a magician or several magicians perform LIVE. That was called the Golden Age of Magic and the Golden Age of Vaudeville. Then along came Movies and then Television and all that stopped. The field shrunk down to only a few big time traveling illusion shows, Blackstone Sr. was the main one. But even Blackstone had difficulty as time went on. Then, there was a time when there were none. At least, none of the big traveling shows. Until, Doug Henning came along, followed by David Copperfield and around that same time Harry Blackstone Jr.. Each one of them had great runs. Two of those great artists died before their time, Henning and Blackstone Jr.. After David Copperfield stopped touring, that seemed to be it. There were no big traveling magic shows. All that has changed, again. 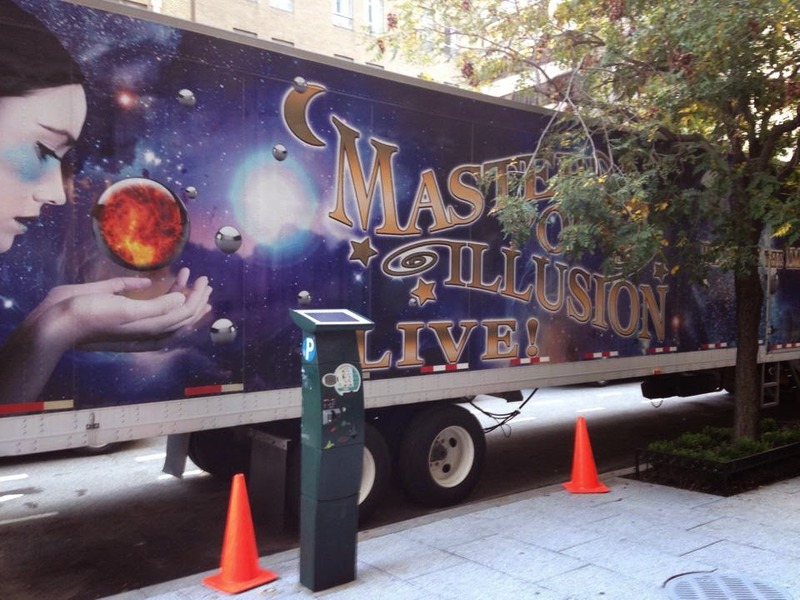 For the past few years a little touring show has been moving across the country called Masters of Illusion. This was followed by a summer TV Series on the CW Network, also called Masters of Illusion, this past summer (2014). The TV show featured different magicians each week demonstrating their various talents. The LIVE show has a revolving cast and I assume all of them have appeared on the TV show at some point. Back to the show. The performers I saw were: Drexus, Titou from France, Farrell Dillon, Greg Gleason, and Rick Thomas. Some of the names I was familiar with, some I wasn't. First up was a video of Farrell Dillon where he did an interactive routine with the audience, which the lay people really enjoyed. Then an illusion act called Drexus was up. He is a tall masked gentleman who did a Fire Cage production (minus the fire, due to restrictions imposed on the company at this venue). He followed with an origami illusion. Both well done. I'm not 100% on this order, but I think Titou from France was up next. Here is a very likeable and funny performer who had some great one-liners in his set. He did the first audience participation routine and it was very well received. Look forward to seeing more from this fellow in the future. Greg Gleason was up next and his first set started with a very unusual Broom Suspension Illusion using a chair and a feather boa. I can't recall seeing anything like this before and really liked it. His assistant was superb and has a million dollar smile. Greg did several routines which I won't reveal because I don't want to spoil the surefire surprises for anyone who has yet to see the show. Farrell Dillon was up doing his first set of manipulation. I like Farrell, I think he is extremely clever and very talented. He is basically doing Chavez style manipulations but he is doing them with very funny patter. He has taken a tired old 'seen it a million times' type of magic act and made it fresh and fun. Rick Thomas was also on hand. Rick is well known for being one of the big Tiger/Animal acts in magic. But on this show, no animals at all. Rather it was Rick and minimal props and a lot of personality. His first routine was a Chair Suspension that looked like a Zany Blaney Ladder Levitation. He did the routine with a boy from the audience and just brought the house down. Great stuff. There was a short intermission allowing folks to get something to drink or buy something from the Masters of Illusion Traveling Store. It looked like they did quite well with back of the room sales, which is great for any show. I totally enjoyed the first half of the show. But let me say, the second half of the show was about as good as it gets in the world of magic. The energy level went up and up after each act. The audience, who had been very receptive to the show from the start, was now moving towards a fevers pitch. Each act was hitting a home run. I'm not revealing any of the routines from the second half except for one. Rick Thomas presented a mini illusion called Liquid Glass. It's a routine created by Jim Steinmeyer and based on an effect of Peter Warlocks. Basically, it's a needle through glass trick done on a larger scale. I have seen it done before. I ALMOST bought one a couple times. Well, when Rick Thomas and his assistant Tara came out, they killed with this prop. In fact, it was so strong, so entertaining, so dumbfounding that all I could think was, "Rick Thomas needs to do a lecture on THIS!" His presentation was brilliant. It had everything you could ask for, it was visually interesting, it was fun to watch, it was energetic, it was funny, it was dramatic, it had movement, class, style and importantly, it was easy to follow, it was crazy good. It's a good trick to begin with, but he brought it to the level of fantastic. The Liquid Glass routine was not the closer to the show, there was much more to come following that routine, but it was such a stand out piece to me, I wanted to make a special notation of it. From an audience stand point, it’s hard to say what their favorite routine might have been. Maybe the Wakeling Sawing where Rick Thomas allowed 20 people to join him onstage. Perhaps it was the breathtaking closer to the show, or the hilarious Straight Jacket Escape by Farrell Dillon. It’s just hard to say. Here is what I can tell you about the show. I watched the spectators, the lay people, from the moment they came in the door. I was really quite surprised at the number of couples that attended, what a great sign. There were children and families who came, but not as many as I would have thought (it was a school night, so that might play into it). The age range was all over the board, people from their 20s right up to Seniors. This was a very ethnically diverse audience. I’d say it was equally split between males and females. The one thing they all had in common, they were having a great time! They got to see top notch magic, excellent comedy, and some really beautiful moments of illusion. This production is Gay Blackstone's baby. I know there are other people involved, but Gay brings decades of experience to this production and it can be seen in every aspect of the show. She deserves the credit for finding the great talent and structuring a show that allows each act to shine equally. I’m sure if you looked closely you would see her fingerprints on almost every aspect of the production. This is a show to be proud of for sure. I want to share a bit of personal history. 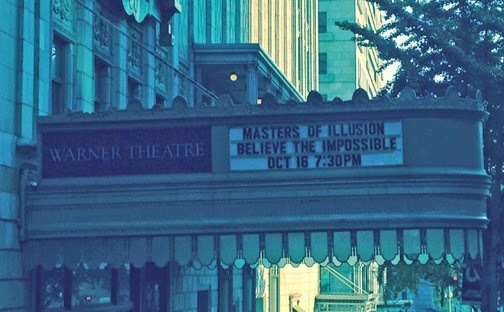 I saw my first professional magic show as a kid at the Warner Theatre many years before. I sat with my parents and brother in the third row from the stage. I was seeing Harry Blackstone Jr. for the first time. He toured with a big production, a live orchestra, and a big cast. I remember vividly when he walked out on stage and made that birdcage vanish. I remember him stepping backstage to get a second cage and repeating the trick, this time with audience members touching the sides of the cage. I remember later in the show the Floating Light bulb, which floated down into the audience only a few feet from where we were sitting. I remember a Patriotic Drum routine where hundreds of flags were produced out of it and eventually a person. I remember the Flower Garden routine. Hey, it was my first real live magic show and I can remember almost all of it. Seeing the Masters of Illusion Show at the Warner was a continuation of this incredible Blackstone tradition. For the audience, it was an evening of wonder and laughter and the very best kind of family friendly entertainment! PLEASE Be sure to support this show if it comes to your area. Tell your friends, your family, your co-workers about the show and where to get tickets. Trust me, they’ll be happy you did! By the way, be sure to check out the October 2014 Issue of Genii Magazine with the Masters of Illusion LIVE TV Show on the cover! Saw the show on th oct 15, the show was great, a lot of migicanisn there. Few magicians 'cause it wasn't free.